No one has added a helpful site for this 2005 Aveo problem yet. Be the first! So I have this happen and the shop I took it to said he's seen it over 20 times. This is not even a GM shop, it's a local repair shop. This is outrageous. To have a problem reoccur this often and never have a recall. My wife was driving the car at the time and it died on a major highway in the left lanes while just starting to get up a large hill. By the time she got to the median on the left side of the highway she had crested the hill and put her and others lives in danger. A major issue and to add insult to injury its going to cost about $2500.00 in parts and labor. GM needs to take care of this so others don't deal with this crap. NOW I FIND OUT IT WAS NOT TIMING BELT, IT WAS THE IDLER BROKE IN HALF. BENT VALES ETC. QUOTED 1,900.00 SO FAR TO FIX. MAY NEED NEW ENGINE!!!?? NEVER A PROBLEM, NOW 2 GRAND TO FIX? WHO TO TRUST, WHO TO BELIEVE...I SEE WAY TO MANY COMPLAINTS ON THIS TO NOT BE A RECALL CAR. BETWEEN THE TIMING BELT, IDLER ARM AND THE SURGE OF FUEL ISSUE WHY IS THIS CAR STILL ON THE ROAD WITHOUT AN ACKNOWLEDGEMENT FOR CHRYSLER.? I'm french so my english is very bad sorry but this problem is horrible for me. only 37,300 miles is 60 000 Kilomètre im go with ultimatum whit GM and Garage sell the car i need to wait 10 day before answer.I'm not pay for this its clear its a default of idler is not the time or the miles he broke this piece. I BOUGHT THE AVEO 2005 IN JAN. OF 2009 THE CAR HAD APPROX. 60,000 MILES I BOUGHT THE EXTENDED WARRANTY ETC.. I HAD TO REPLACE THE ALTERNATOR AT GOODYEAR SERVICE CENTER IN KANSAS CITY KANSAS, FOR THE MOST PART THE CAR HASN'T BEEN A PROBLEM UNTIL THE IDLER PULLEY BROKEN IN HALF, THE PULLEY THAT HELPS KEEPS THE BELT IN TENSION, NOT THE IDLER TENSIONER, THE PULLEY I'M TALKING ABOUT IS LOCATED AT 03:00 O'CLOCK LOOKING FROM THE PASSENGER SIDE. THE IDLER PULLEY BROKE IN HALF, THERE WAS MAJOR HEAT FRICTION, THE TIMING BELT DID NOT BREAK THERE WERE NO SIGNS OF DAMAGE BUT THE PULLEY WAS MELTING DUE TO THE FRICTION, THERE WAS SO MUCH FRICTION THAT THE IDLER PULLEY TENSIONER HAD INCURRED RESIDUE FROM THE OTHER PULLEY, BASICALLY THE TIMING BELT WAS REPLACE BEFORE I BOUGHT THE 2005 AVEO BUT THE PULLEYS WERE NOT REPLACE, NOT ONLY THE TIMING BELT SHOULD BE REPACE ALL PLASTIC PULLEYS SHOULD BE REPLACE. ALL VALVES ARE BENT THE PISTON TOPS ARE NOT CRACK THERE SEEM TO BE NO DAMAGE TO PISTON, I THINK BUT NOT SURE???? THE EXTENDED WARRANTY HAS RAN OUT THE CAR IS SITTING IDLE NOT SURE WHAT TO DO WITH THE CAR. THE DEALERSHIP HAS ASK ME TO BRING THE CARIN THEY WILL LOOK AT IT. I DO NO HAVE THE MONEY TO REALLY PUT IT BACK. THE GARAGE MECHANIC SAYS THE BOTTOM END OF THE ENGINE HAS NOT BEEN EFFECT, BUT I'M NOT SURE?? I STILL OWE ON THE CAR SO I WOULD LIKE TO PUT IT BACK TOGETHER FOR THE LEAST AMOUNT MONEY, A USED ENGINE WITH LESS THEN 60,000 MILES WILL WORK I THINK SOME WERE AROUND $2000.00. GETTING BACK TO THE IDLER PULLEY OR ASSIST PULLEY ARE MADE WITH CHEAP PLASTIC MATERIAL THE PULLEY DESIGN IS BADLY DESIGN THE WEB OR SPOKE DESIGN IS AT FAULT FROM THE START, THERE IS NO WAY THAT PULLEY IS CAPABLE IN LASTING, I BELIEVE THAT THERE WAS SEVERAL POROUS CAVITY WITH THE PULLEY WAS INJECTED OR MOLDED, THERE HOT SPOTS AND COLD SPOTS CAUSING A STRESS FRACTURE FROM THE START. THE TIMING BELT. I BELIEVE THAT THE ENGINEERS WHO DESIGN THIS CAR WERE OUT TO LUNCH WHEN THEY SIGNED OFF ON THIS CAR AND PROJECT MANAGER TO GENERAL MOTOR OF DIVIDE FELL SHORT THEY HAD NO INTENTION MAKING THIS CAR AVEO. GENERAL MOTORS KNEW FROM THE BEGINNING THAT THE TIMING BELT AND PULLEY SYSTEM WOULD FAIL FROM THE START, FOR SOME REASON I THOUGHT THAT MAYBE I COULD GET BY WITH THE AVEO FOR AWHILE AND HAVE IT PAID OFF, BUT NOW I'M STUCK BETWEEN A ROCK AND HARD PLACE TRYING TO GET THE FIX OR BUY A USED ENGINE. I had the idler pulley replaced on my 2005 Chevy Aveo at 11,000 miles and that was under warranty. Then at a little over 63000 miles it dies on the highway. Had it towed to the dealer and the idler pulley broke again, this time causing major damage to the engine. So far GM is not taking responsibility for the problem. Dealer is telling me $2,500 minimum to fix it. The car isn't worth much more than that since it dents and chips soo easily. I just had to replace the wheel bearings and the horn in the last 5 months, now this. I can't wait to be rid of this car! The timing belt was replaced around 20,000 before the idler pulley broke. The belt was 23 months old and had been replaced at the dealership. GM agreed to pay a percentage of the repair costs including labor. I had the engine replaced with a used engine, now it has the check engine and hold lights flashing. The local Chevy dealer does not have a clue what is causing it. They called the tech line and now are telling me that the head needs rebuilt. The engine runs great. I may wear my hip waders when I go pick up the car. Really deep. My 2005 Aveo engine needs to be replaced and the repair would cost more than the car is actually worth. 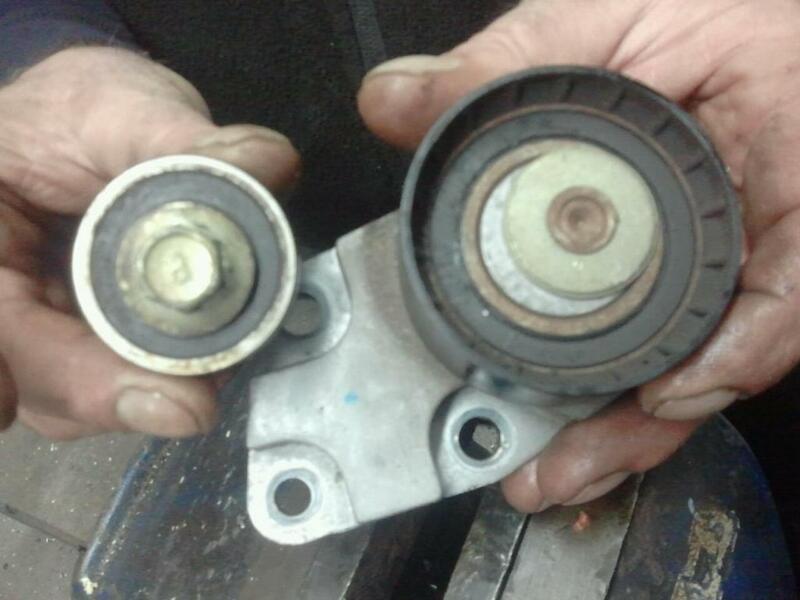 The idler pulley broken in half. Ridiculously frustrating. If a car company can't stand behind their vehicle at least until it's paid off, what's the effng point? My 2005 Aveo died on the highway at 70 mph- my mechanic told me the idler pulley broke in half, and that she had never seen such a thing happen in any car. She advised me to contact GM, as we only had 60,455 miles on the car, and she thought GM should address why such a dangerous break happened. We had the car towed to our local dealer, and they did their own diagnostic, confirmed what my mechanic said, and then told us we were screwed because we were past warranty, AND we had never replaced the timing belt. I've clawed my way up the shady GM food chain as far as our District Manager, the person responsible for deciding we'd be denied coverage for repair costs. I have no contact information for her, and nobody in the GM system will give it to me. I've called the wildly misnamed Customer Assistance Center every single day, e-mailed every day, and am quickly getting nowhere fast. Please advise. Bail ME out, GM! !